Bali International Rafting company that is right for you to do this activity. Bali International Rafting is one of the best companies are able to bring you enjoy the beautiful voyage through the Telaga Waja river. Surely it would be very nice if you can feel beautiful and natural panorama of Telaga Waja river along with the Bali International Rafting. Pick up from the hotel directly. Then our driver will take you to the location Rafting. Arriving at the start point, you will be welcome to wear standard rafting equipment. It did not take long to reach the river from Bali International Rafting Lobby. Little information and instruction will be given by the captain guides. 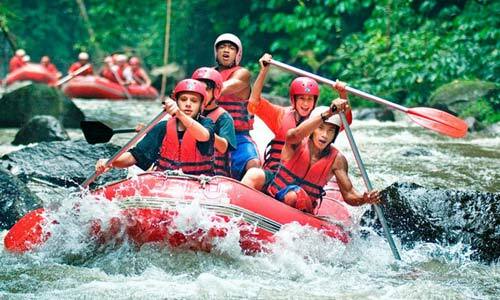 Telaga Waja river wading or less as far as 12 kilometers, giving us the experience will not be forgotten. Beautiful scenery and amazing will adorn your day while doing this activity. Bali International Rafting provide services that would satisfy customers who do rafting on the Telaga Waja River so as to make your holiday in Bali will always be beautiful to remember. It took approximately 1.5 hours to reach the rafting site from Kuta area. Arriving in the location, you are offered several types of drinks such as coffee or tea. Installation of equipment for rafting will be done as soon as you finish your drink. Before entering the river, some important points are explained by a chief guide to each participant rafting. Several small bridges and beautiful waterfalls you will see around the river. The activities of people around the river will also add charm to the atmosphere is quiet and peaceful countryside. This is a place where you and other participants will plunge rafting altitude of approximately 3.5 meters. Rafting guides will explain some of the things that you have to follow just before the activity is done. Do not forget to give your best smile because there will always be someone who take pictures while doing this activity. This is a good company, well organised and the guides were great. The guide is professional in his job and their rafting equipment was in good condition. Amazing trip I've done in Bali. Will come again soon. So enjoyed it as much, good for beginners and I would do it again soon. This activities is kids friendly and suitable for all ages above 8. Thanks Bali Tours for make this amazing trip. Highly recommended.